Everyone wants to succeed in their own, personal ways. For you, that may mean becoming head of a large company, or raising a family. Whatever success looks like for you, you’ve got to work to achieve those goals. 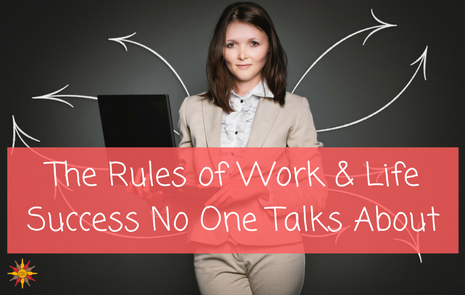 Here are the rules of success that no one talk about, but can help you get where you’re going. No matter how good you are, you can’t do everything. You want to have an incredible home life, a career that takes you all over the world, and hobbies that are fulfilling and engaging. These are all good things to strive for, but you’ll have to make compromises along the way. No one can have everything, and if you accept that you can set yourself reasonable goals. If you want to get the most out of life, you’ve got to use those resources wisely. This can refer to money, both in your home and professional life. Use credit sparingly, and try and earn more than you earn every month. This also refers to time, too. You only have 24 hours each day, so plan out that time well to get the most out of the day. As the saying goes, no man is an island. If you try and go everything alone, you’re going to struggle. Look to build up relationships in both your personal and professional lives. The more people you have on your side, the easier you’ll find things when the going gets rough. It’s amazing what friends can do for you when you need them. “Whether something positive or negative happens in your life, accept the responsibility for it,” says content writer Paul C. Otero from Best British Essays. “No matter what happens, accept it, learn from it, and move on.” If you can do that, you’ll have much more success than someone who can’t accept his successes, or blames his mistakes on others. You may think you should treat others how you would like to be treated, but that doesn’t actually work that well. The problem is, you may not like certain actions that others would prefer. Take getting in touch. You may prefer to talk via text, but they’ll want to talk on the phone. Pay attention to other’s needs, and work with them as much as you can. this doesn’t mean you have to be a pushover. Show others that you care about what they have to say. You can actually learn a lot, if you put your own thoughts aside sometimes and really listen. If you show kindness, you’ll attract people to you as you’ll be the kind of person they want to get to know. If you can do this, and stand up for yourself when needed, then you’ll get far. As you can see, a lot of the rules of success rely on you doing everything in moderation. Know where your limits are, and pinpoint what’s important to you. If you can do this, you’ll see a lot of success in both your professional and your personal lives.